I recently participated in a discussion with a group of media specialists who met virtually to engage in some conversation with a few HS librarians who are actively teaching to the CCS with their teachers. Sharing was facilitated by author/speaker and former school media specialist Toni Buzzeo. School media specialists want to be involved and work with teachers, but many are overwhelmed. They want to know how to collaborate with teachers and what to do to get started. Several shared what they are doing. Examples include focusing on standards, what resources will support them, and meeting with teachers. Others are updating media center web sites to meet new needs, aggressively updating collections, and acquiring more resources to meet the CCS informational text requirements. Throughout our discussion I thought of how this is not that different from what we’ve long been doing– collaborating with teachers to integrate and infuse information literacy throughout the curriculum. I would apply my “work with the living” philosophy and reach out to those who are interested in trying new things and using new resources such as digital primary resources from the Library of Congress. But, what may be familiar is not all the same. High stakes testing and the emphasis on accountability in the classroom and media center place a greater importance on successful and educational meaningful collaboration and integration. The CCS standards are more complex and more far-reaching than the others. 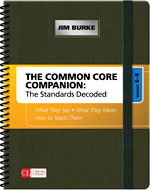 After our discussion ended I came across The Common Core Companion: The Standards Decoded, Grades 6-8. It’s a very practical book that makes CCS very understandable. I am impressed with this book! It clearly depicts the alignment/integration of Common Core Language arts standards in reading, science/technical subjects, speaking/listening and writing. Many clear examples, including several involving technology are included. The format and layout clearly shows the cross-disciplinary nature of CCS. The easy-to-read bulleted text and generous note-taking spaces are a plus. I shared the book with a social studies teacher/future media specialist. She instantly saw its potential as a tool for her own teaching and as a PLC leader. I examine many books as a reviewer for LMC magazine; this one stands out! Debbie Abilock said Burke’s a pro – his teaching strategies and student-focused instructions are a proactive, intelligent approach to synthesizing and integrating information while avoiding plagiarism. Debbie Abilock, Noodle Tools, December 2013. 2 Responses to "Making Sense of the Common Core Standards"
Thanks so much, Mary Alice! I really appreciate your review here. I have been emphasizing the important role of media specialists/librarians whenever I talk about the CCSS. There is also, for your information, a 9-12 edition of the CC Companion and, coming this spring, a K-2 and 3-5 edition. Thank you. I look forward to seeing the other levels! What’s the story behind the photo? One Teacher's Perspective: A Wisconsin educator's perspective on public education-related matters and a bit more.